Composed by Daniel A. Walzer. 21st Century, Contemporary Classical, Jazz, Repertoire. Score, Set of Parts. 6 pages. Published by Daniel A. Walzer (S0.318049). 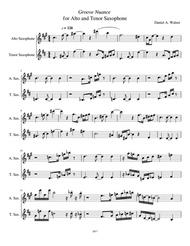 Groove Nuance is a duet for alto and tenor saxophone that features playful, rhythmic interplay between the performers. Each musician plays a series of repeating patterns, while exploring melodic passages influenced by jazz and popular music. The piece is moderately difficult and would be appropriate for intermediate and advanced players.